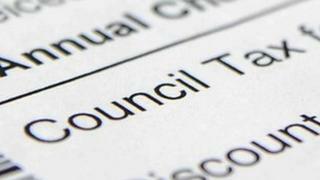 Local government has been more than adequately compensated for revenues lost through the council tax freeze, new research has suggested. The Scottish Parliament's information centre has been looking at the figures. It found extra cash given by the Scottish government to councils was worth slightly more than they would have raised by increasing council tax. But the research also suggested councils' share of the Scottish budget has been squeezed slightly. The Scottish government faces frequent criticism from opposition parties, councils and unions over the money it hands to local authorities, with claims of increasing centralisation and a failure to properly compensate councils for the SNP's flagship pledge to keep council tax frozen. However, these findings from the Scottish Parliament Research Centre (Spice) suggest the council tax freeze is actually "overfunded". Local government's share of public spending between 1999/2000 and 2015/2016 has shown only a "modest" reduction of 0.2%, in contrast to Labour's claim that "heavily centralised commitments, such as the underfunded council tax freeze, are placing an unbearable burden on local authorities". Spice said: "The extent to which local government has received a 'fair deal' from the Scottish government is the subject of much annual debate in the parliament. "Over the period 1999 to 2016, local government's share of the Scottish government budget has decreased from 36.2% to 32.2%. "However, once police and fire budgets are added back in for 2013-14 to 2015-16 to provide figures closer to a like-for-like basis, local government's share has decreased by only 0.2% to 36.0%." It added: "Since the council tax freeze was introduced in 2008-09, there has been much debate over whether it is 'underfunded' - whether the additional £70m paid to local authorities each year is enough to cover what could have been raised had local authorities had control over rates. "In fact, the money provided by the government to freeze the council tax has resulted in local authorities receiving more income than they would have done by increasing rates by RPI (retail price index). "The council tax base has increased over this period due to factors such as revaluations of existing properties and new properties, which will have the effect of increasing council tax income despite the freeze. "Therefore, on the basis that the freeze was intended to compensate for a foregone per annum increase in council tax, it could be said that the freeze, over the period 2008-09 to 2013-14, was 'overfunded'." The SNP shelved a 2007 manifesto pledge to replace the council tax with local income tax. Leaked documents later revealed it could have left a funding gap of about £380m a year. SNP MSP Kevin Stewart said the Spice report "completely demolished years of bogus claims from Labour". He added: "With independent experts completely rubbishing Labour's position on the council tax, it's time for Kezia Dugdale and Labour to apologise for eight years of these grossly misleading claims - and to take the opportunity to completely rethink their negative brand of politics." Speaking during a visit to Barnardo's Cymru in Cardiff, Ms Dugdale, the Scottish Labour leader dismissed the SNP's demand for an apology. She added: "We accept that the council tax system in Scotland is unfair and for too long no-one has done the hard work to find out what should go in its place. "I look forward to the conclusions of the ongoing review and that all parties in Scotland can get behind it." The Scottish Conservatives said councils should be given the freedom to have a say on how they spend their money. The party's local authority spokesman Cameron Buchanan added: "The SNP would do well to stop bickering about council tax funding and focus on giving councils more autonomy." A spokesman for council umbrella body Cosla said: "I don't think that the timing of this report is accidental. "As we enter into discussions with the Scottish government around the spending review this report provides a meaningful context for those discussions. "As we all know it would be wrong to get distracted from the real issues. The report shows that despite increasing need for core local government services the funding is not keeping up." How could the SNP replace council tax?